When, of all people, Mort Shuman wrote ‘Machines’, I wonder did he intend it to sound like this. Given that this and Manfred Mann’s versions are all drums and bongos and such leans towards a “yes”. 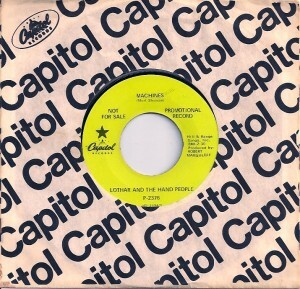 Lothar & The Hand People first and foremost had a killer name. Immediately uncomfortable sounding. On first look, you could’ve mistaken them as one of the San Francisco bands, which indeed I did for a while. Being on Capitol Records blindly reinforced the possibility, as the label seemed to lean west coast when it came to domestic signings. Indeed, the band were New York based, and who knows, may have stumbled on ‘Machines’ at The Brill Building. It’s possible. Supposedly one of the first electronic rock bands to use Moog in the lineup, as with Silver Apples, seems they set the stage for Suicide a few years down the line. Lothar in fact refers to the band’s theramin as opposed to a member. 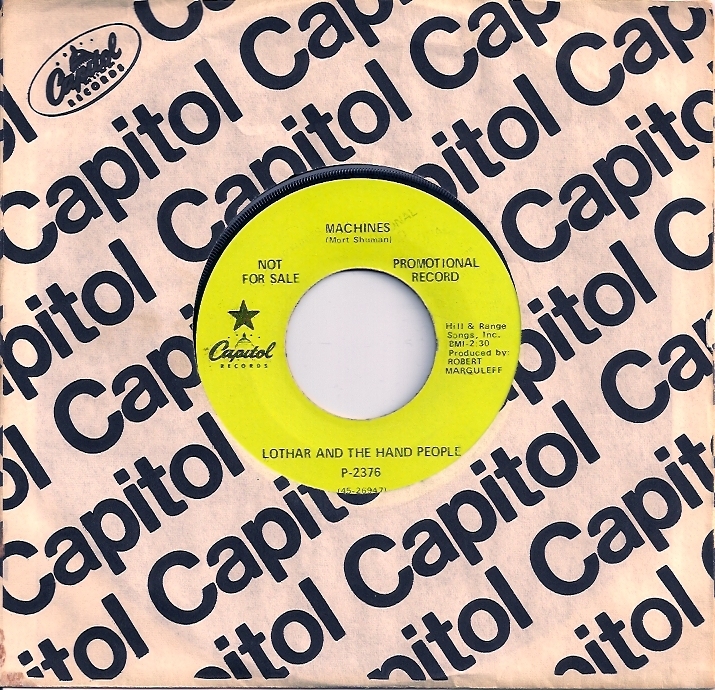 ‘Machines’ got a lot of late night AM radio play summer ’68. All things were leaning underground, as the genre was called, and many of the major market Top 40′s were programming the sound of youth culture at night. Nowadays, US pop radio just swims as hard against that tide as possible. It’s how I heard it – and only ever heard it via the transistor radio under my pillow until snatching a copy in a shoe store running some kind of tie-in with one of the local Top 40′s. Buy a pair, get a free single. I was having none of that. Sweet talked about fifteen 7′s out of a peer working the register. This entry was posted on Monday, October 18th, 2010 at 12:01 am	and is filed under Capitol, Lothar & The Hand People, Manfred Mann, Mort Shuman, Silver Apples, Suicide. You can follow any responses to this entry through the RSS 2.0 feed. Responses are currently closed, but you can trackback from your own site.